The Royal Astronomical Society of Canada and the Canadian Astronomical Society have established an award entitled The Plaskett Medal in recognition of the pivotal role played by John Stanley Plaskett (1865-1941) in the establishment of astrophysical research in Canada. Plaskett helped to confirm the rotation rate of the Milky Way. He was an active member of the Ottawa Centre between 1907 and 1918 and acted as an Associate Editor of the Journal for 28 years. 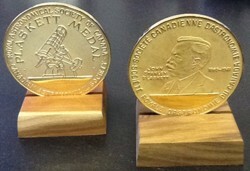 First presented in May 1988, the Plaskett Medal is jointly sponsored by the RASC and CASCA. The history of the Plaskett Medal, which evolved from the Society’s Gold Medal (now awarded by the Toronto Centre to a U. of T. student), is published in JRASC Vol. 82, No. 6, 1988, pages 312-316. The award, consisting of a gold medal, is to be made annually to the Ph.D. graduate from a Canadian university who is judged to have submitted the most outstanding doctoral thesis in astronomy or astrophysics in the preceding two calendar years. Thus it is possible to re-nominate a candidate for whom an unsuccessful nomination was made in the preceding year. The recipient is invited to address one or the other of the sponsoring Societies (at his or her choice) at their Annual Meetings. According to the policy of each Society, some or all of his or her expenses to attend the meeting will be covered by the hosting Society. The recipient will also receive a $750 honorarium. Canadian Astronomical Society's Plaskett Medal page. JRASC articles relating to J.S. Plaskett at the bottom of this page. Links are provided for the few citations published in JRASC.